If you need a replacement Kohler Fuel Filter, individually or by the shop pack. Jacks can provide what you need. When you need to replace the Fuel Line, whether it’s just the line you need, or if you need all the hardware as well, Jacks can provide those as well. 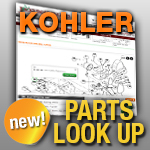 Search below with your Kohler part number to get started!